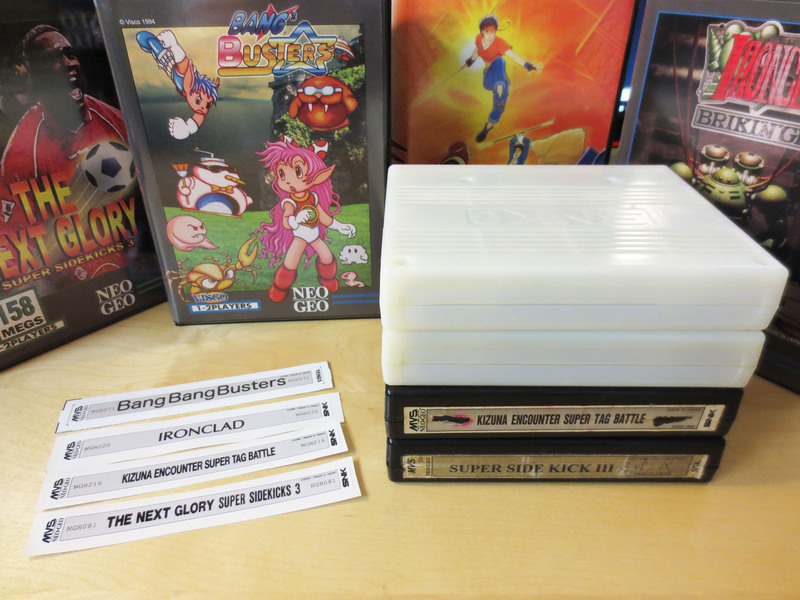 About six months ago I discovered a user on the forums at neo-geo.com by the handle shadowkn55 who makes very high quality replacement labels for Neo Geo MVS cartridges. At that time I purchased eleven label which really improved the look of those games. All those details can be seen here. More recently I purchased another batch of labels and I’ve managed to clean four carts and apply the new stickers. And again the transformation is awesome. 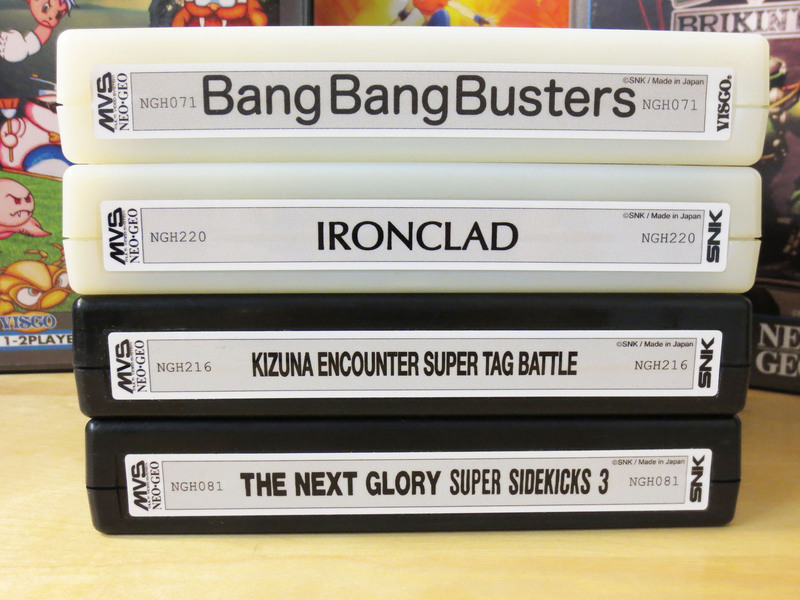 Nice new labels by shadowkn55 from neo-geo.com. 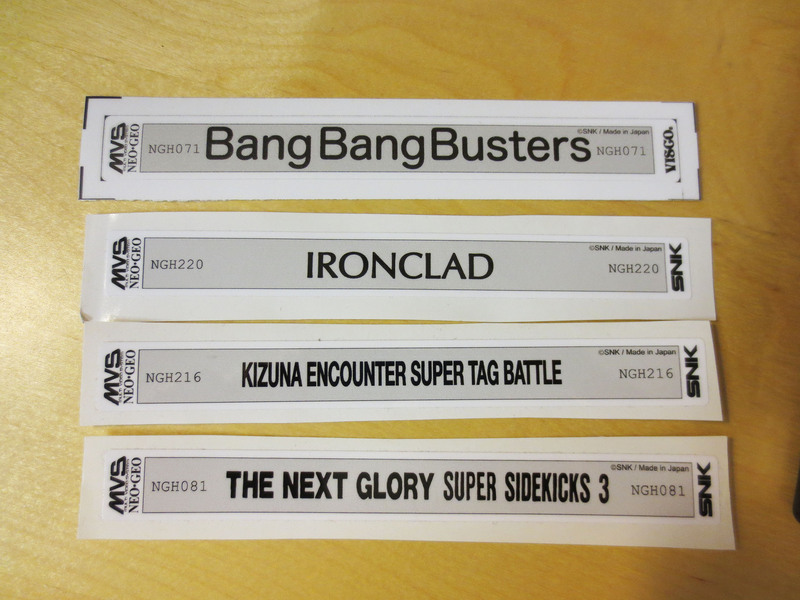 Above are brand new reproduction labels for Bang Bang Busters, Ironclad, Kizuna Encounter and Super Sidekicks 3. When you see the images below you’ll know why I decided the original labels had to go. Beat up labels or entirely missing labels! 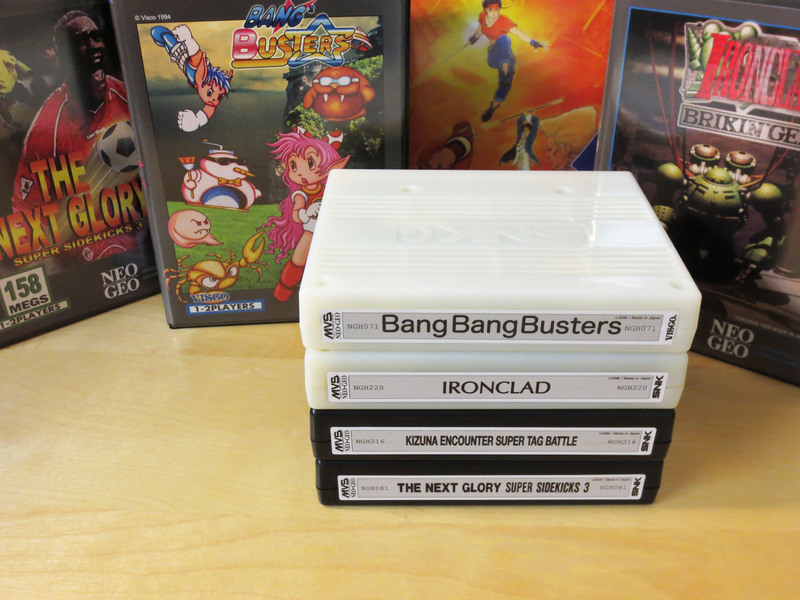 For starters both Bang Bang Busters and Ironclad are games that were originally developed for the Neo Geo but never actually got released. It was only later when the ROMs were found in the wild that people started putting the games on cartridges. Which is why these two games didn’t have any labels at all. Bang Bang Busters is an excellent game that is very similar to Snow Brothers. Ironclad is also a good game and is very similar to R-Type; complete with charged shot and a detachable pod. I haven’t beaten these games but they feel very complete and polished. They are really nice additions to my Neo Geo collection. On the Kizuna Encounter label you can see two tears; one tear to the left of the title and one to the right. Originally the sale SNK game cartridges were restricted to a particular region and the carts could be tracked by their serial numbers. So if someone who purchased a game later wanted to sell it they would often remove the serial number so that SNK could not track the cart back to them. Seeing two tears like this is pretty common on Neo Geo MVS carts. 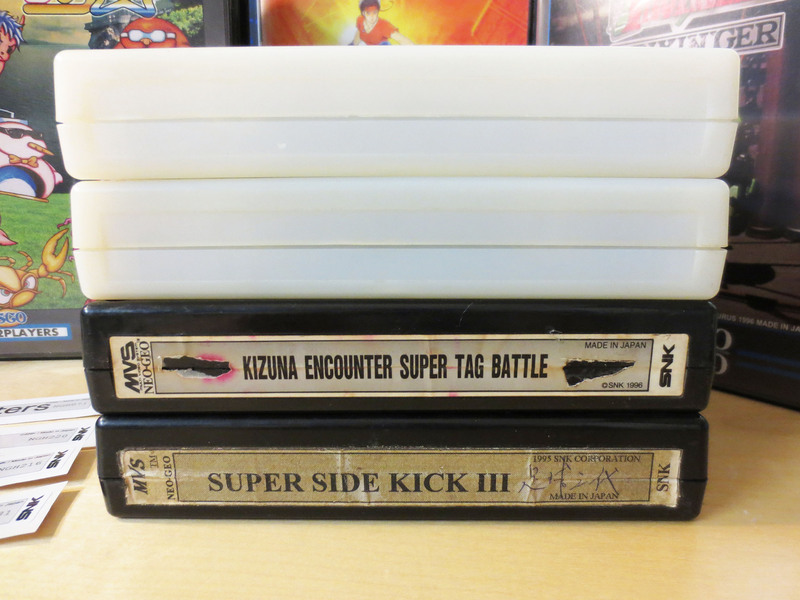 The label on Super Sidekicks 3 looks like it might have already been a reproduction. It did not have rounded corners, seemed to be thinner paper and was matt like regular paper (That’s just a guess). That suspicion combined with how beat up the label was made it easy for me to decide to replace it. Above is the final product. I love it. They look fantastic. I’m always a little conflicted when altering an original product but I feel the two labels I removed here were beat up enough to warrant the reproduction labels.